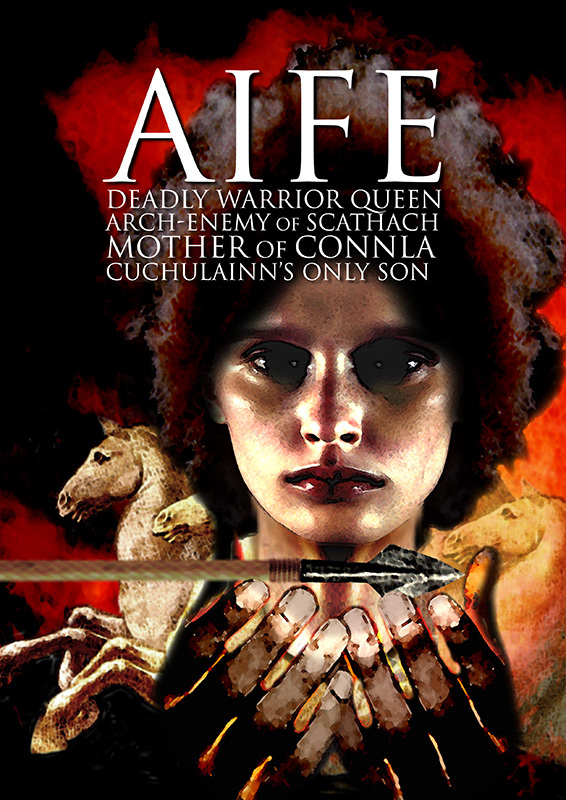 Aife was the mother of Connla, Cú Chulainn’s only son. She was a deadly warrior queen and the archenemy of Scathach, who trained Cú Chulainn in the arts of war. Afraid that her star pupil would be hurt, Scathach gave Cú Chulainn a sleeping potion before going into battle against Aife. On any other man, that potion would have lasted twenty-four hours, but on Cú Chulainn it only lasted one, so he went into battle against Aife’s army without her knowing. Aife’s three champions, Ciri, Biri and Blaicne, the sons of Eis Enchenn the bird-headed, challenged Scathach’s two sons to a fight. Scathach was worried about the outcome as they were two against three, but Cú Chulainn joined the fight, and Aife’s three soldiers were killed. Aife then challenged Scathach to single combat, a type of battle that meant that either both women could fight one-on-one, or they could nominate a champion. Cú Chulainn insisted on fighting as Scathach’s champion, but before the fight, he asked Scathach what Aife held most dear in the world. Scathach told him: her two horses, her chariots and her charioteer. Cú Chulainn met and fought with Aife, and she was deadly in battle leaving him only the stump of his swords. Aife looked around, distracted, and Cú Chulainn took his chance, seizing her and holding her down by her two breasts. Now in a position of power, Cú Chulainn bargained with Aife for hostages for Scathach’s army, a promise never to attack her again, and for her to bear him a son. These she granted him, and Cú Chulainn left Aife with a child and with a gold thumb-ring which he was to wear when he was old enough to come to his father. He named their son Connla before he left her. Aife was the equal in prowess to Cú Chulainn, one of the greatest warriors of Irish myth. Where he won most victories against famous warriors with ease, Cú Chulainn had to resort to trickery to get the better of Aife, which shows just how formidable she was.